Get a bandwidth and connectivity boost for your Apollo Interface. 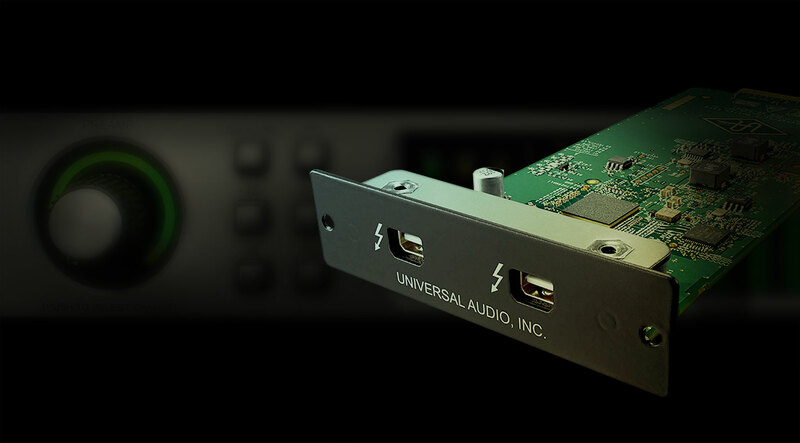 The Thunderbolt 2 Option Card for Apollo and Apollo 16 audio interfaces provides blazing fast PCIe audio drivers, greater UAD plug-in instances, improved performance at higher sample rates, and reduced UAD plug-in latency versus Apollo’s standard FireWire connection. Compatible with Intel’s Thunderbolt technology on the latest generation of iMacs®, MacBook® Pros, MacBook Airs®, Mac minis, and Windows* systems, the Thunderbolt 2 Option Card offers unrivaled bandwidth and next-generation connectivity for the Apollo interface. The user-installable Thunderbolt 2 Option Card includes two Thunderbolt ports, and easily slides into the expansion bay of Apollo. Bus power is provided to downstream Thunderbolt devices, allowing music producers to connect Thunderbolt peripherals in series with the Apollo interface — including hard drives, computer monitors, and 4K displays. Add unrivaled bandwidth and next-generation connectivity to your Apollo interface. * For full Windows compatibility requirements, click here.